Batman V Superman stars Henry Cavill, Ben Affleck, Gal Gadot, Amy Adams, Jesse Eisenberg, Jeremy Irons, Holly Hunter, Diane Lane, Laurence Fishburne, and Jason Momoa. After Superman’s (Cavill) fight with Zod in Man of Steel, Batman (Affleck) makes it his mission to take him down and make him pay for the death and destruction he caused. As these two icons of comics prepare for their battle the world has it’s own battle over their statuses as heroes or villains. I have made a video on the subject of Batman V Superman. In it I described my thoughts and opinions on the movie before my own viewing. To summarize my points I’d say I wasn’t interested at first, but managed to turn myself around after seeing the final trailer and knowing more about the director, Zack Snyder. I admitted in the video that the plot could turn out to be thin, but in reality the movie has just enough plot to keep me interested. BVS does a great job of establishing the characters of it’s own universe, separate from the previous ones, while still following the familiar beats that make these characters who they are. Superman does what we expect of him: he saves those in need, he doesn’t want to be seen as a god, despite his power he is still a human being, and that he loves Lois Lane(Adams). Batman is a more angry, vengeful Batman who brands criminals and actually kills some of them. I wasn’t annoyed by his killing, just surprised at the number of bodies he wracked up. I can understand why they changed him, they needed more tension in the fight. The stakes are high in their fight, as someone will die no matter who wins. Speaking of the fight, it’s one of the highlights of the film. 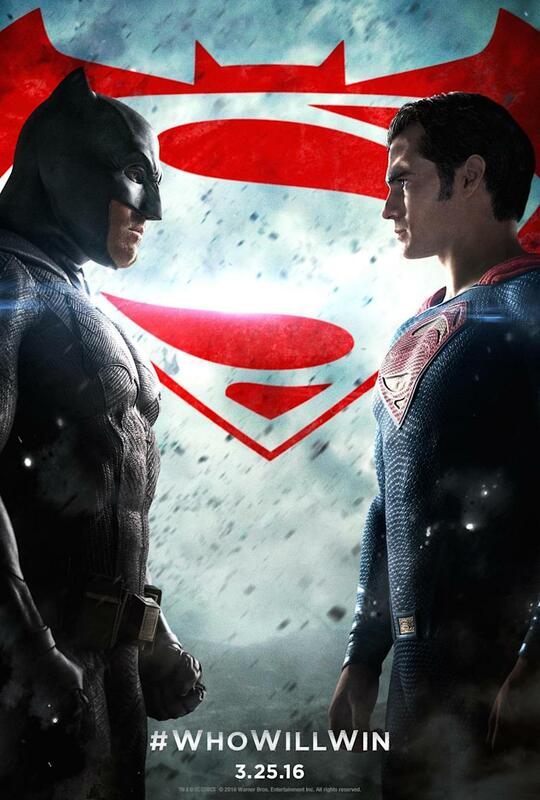 Batman has an interesting assortment of weapons and Superman’s pure strength make a great fight. The hits are brutal and the visuals and sound design escalate it to new heights for a superhero fight. While the fight does end in a little anti-climatic way, it did have a powerful impact once I put it all together. Every fight in the movie is amazing, from the Arkham style fight to the final fight which has great cinematography and editing. There’s a great Batmobile chase scene that looks directly from Arkham Knight. The villain, Lex Luthor, was one of my favorite parts of the movie. His actions are some of the most evil things I’ve seen a villain do in a superhero movie. He has almost complete control over both main characters and I can feel that everything from the beginning to the end of the movie were all part of his plan. While he’s on screen Jesse Eisenberg is just unpredictable and with his twitching and stuttering it feels like he can explode at any moment. My one con for him is that he does go on too much with his religious metaphors. The side characters that are here were pretty good to me. Jeremy Irons is a good Alfred and keeps his trademark snarkiness. Gal Gadot as Wonder Woman is great, especially in the later portions of the movie. Laurence Fishburne as Perry White keeps up his good performance from Man of Steel. Diane Lane as Martha Kent while only in for a short time, gives more life to her character. Amy Adams as Lois Lane is still one of the lesser points of the movie but she has good chemistry with Cavill and Swanwick (Lennix). Now for a couple cons I had. The movie is a little slow in the beginning as it sets up the world currently. The terrorist and Senate meetings were a little boring, but Holly Hunter as Senator Finch is a good character and the pay off to both plot lines is worth the build up. Henry Cavill was still a little wooden in certain scenes, but he’s good in most scenes and his actions are more indicative to his character than his words. Now, here’s what must be said of the movie. It certainly does meet the intentions that the movie set out to do. It introduces our characters, creates a reasonable enough reason for them to fight each other, has an exciting fight between them, and it sets up the future of the universe. The movie feels like it’s a grand scale and makes the events feel like big and important. Overall it’s a great movie that could be tightened up in a few places and I hope that the director’s cut can make this an even better movie. March begins but this marathon continues. Today’s comic is Sensation Comics #1. Continuing after All-Star Comics #8, Wonder Woman returns in her own solo series. This issue is here to create a status quo for Wonder Woman. It tells how she met her lover, Steve Trevor, how she made it to America, and how she gets her secret identity. And for the standards of the 40s this is an alright book. There’s the occasional oddity, the invisible jet comes to mind, but at the time Wonder Woman couldn’t fly. Wonder Woman also somehow gets famous for blocking bullets with her bracelets. A lot of story is covered here so individual plot lines usually last about 2 pages and then transition into the next. The art is good and bright, which is the usual for this time. It’s odd how yellow back then was the standard for famous comic covers, but now it’s rarely used. I’m rambling now so I’ll wrap this up; the book is good but you have to put yourself into that old mindset where you don’t over analyze and question everything. To celebrate the one year anniversary of Vintage Bullet on March 3rd I have decided to do another marathon. This will be a special #1 issue marathon. From today, February 26th to March 3rd I will review 1 #1 issue a day. And we’re back with the first review of 2016. So I’m gonna start off with the book that kicked off DC’s New 52 reboot, the Justice League. For the beginning of a new universe and as the flagship title of DC I’m glad to say that this book is really good. The banter between heroes establishes some motivations and characterizes them well. The personality choices are a little odd, especially for Superman and Green Lantern, but in story they just started being public superheroes. The story is told well with a good mystery aspect as we follow Batman trying to solve the mystery of who’s invading Earth and how to stop them. In the tradition of heroes fighting, Green Lantern and Batman fight against Superman in issue 2 and it’s the highlight of the book. There’s also the top notch art of Jim Lee that keeps this book enjoyable. His designs for the Justice League have this uniform “collared” look while still standing out from each other. There are multiple splash pages that emphasize the epic moments of the heroes while keeping the story moving quickly. My only two complaints would be how Hal is kind of a tool who admits he’s only here to look cool and doesn’t really care about saving people. The villain of the story, while a good choice, is defeated a bit too easily with not much effort on the heroes’ side.